Bill Haley, the rock 'n' roll icon in the days before Elvis Presley, once admitted: "Even in my wildest dreams I would never have expected that my music would become so popular." For rebellious youngsters who were speaking out against their parents' generation, rock 'n' roll and new fashions were an expression of their own feelings about life. As mass events, rock 'n' roll concerts therefore became crystallization points for young people's rebellion against the bourgeois-patriarchal society of the Adenauer era. Since outbreaks of violence by rebellious youth, exaggerated in the press, were not exactly uncommon, riots and scuffles with the police became almost routine at large rock 'n' roll concerts. 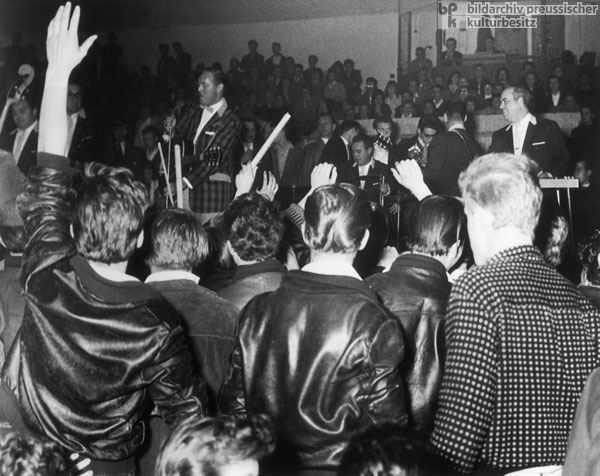 At a Bill Haley concert in Hamburg's Ernst-Merck-Halle in October 1958, young concert-goers picked a fight with guards from the Hamburg student association and then with about a hundred policemen who were trying to clear the hall; altogether, the damage amounted to 20,000 DM. When Bill Haley played at the Sportpalast in Berlin that same month, the outcome was even worse: five policemen severely beaten, six members of the audience seriously injured, and damages amounting to 50,000 DM. Photo by Benno Wundshammer.